Scottish Canals is set to transform the capital’s canal at Fountainbridge with a £330,000 programme of works which will see the area benefit from towpath upgrades, vibrant landscaping and new moorings. With the new Boroughmuir High School opening in 2017 and further development expected in the surrounding area, Scottish Canals, Sustrans Scotland and The City of Edinburgh Council are planning a series of works to ensure even more people can safely enjoy the Union Canal. Richard Millar, Director of Infrastructure at Scottish Canals, said: “The towpaths of the Union Canal are busier than ever before and, with a lot of developments ongoing in the area this route is becoming an increasingly significant destination for leisure, exercise and commuting. This project will improve access to them by providing a safe, all-weather surface that anyone from cyclists and walkers to wheelchair users can use and enjoy. “In addition to the towpath upgrades we will be carrying out essential maintenance and repairs to the canal wall and adding new moorings. By carrying out the works at one time we hope to minimise disruption for users. “We are pleased to provide funding towards improvements to Edinburgh’s Union Canal project at Fountainbridge. We contributed the investment through our Community Links Programme, which provides funding for the creation of cycling and walking network infrastructure for everyday journeys. “The Union Canal towpath is a vital part of the active travel network for many people in the capital and the upgraded towpaths will enable more people to choose to walk and cycle more often as part of their day to day lives. The programme of works will include, towpath upgrades, landscaping, repairs to the canal wall, essential archaeological surveying and the installation of new moorings. Works will get underway on Monday 5th September and will last approximately four months with the towpath being closed at different intervals during this time. 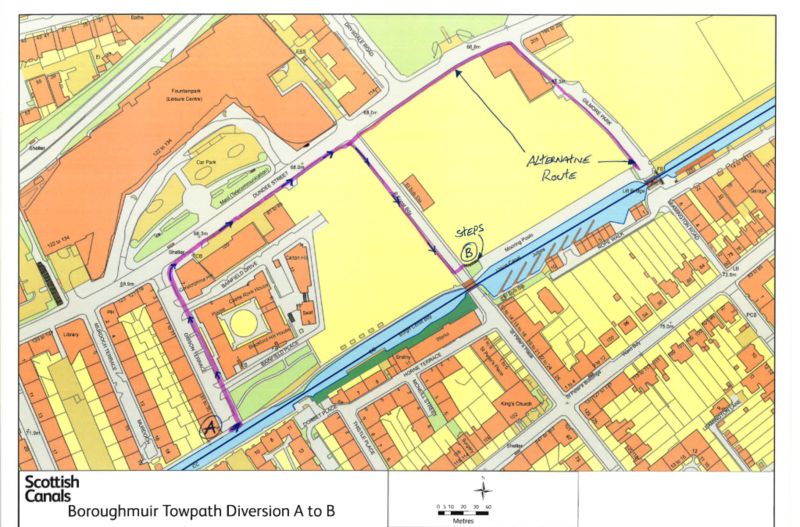 From Monday 5th September to Thursday 8th September a simple diversion will be in place to direct towpath users heading west along the canal. The diversion route will take users along Gibson Street to Dundee Street then back down Gilmore Park onto the towpath. For users heading east along the canal the diversion route will be reversed (Gilmore Park – Dundee Street – Gibson Street).